On Friday, 11th February Home of Metal will be joining the celebrations at Scruffy Murphys. 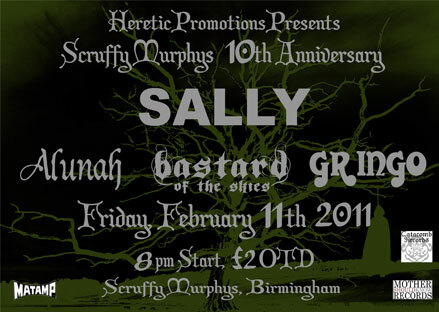 It’s the rock pub’s 10th Birthday and they’ll be celebrating it in true metal fashion with a night of live doom and stoner metal featuring Birmingham’s very own Sally. We’ll be bringing along photographer Steve Gerrard who’ll be taking your portraits to contribute to the ongoing collection of fan photos, that could feature in one of our Home of Metal exhibitions.